It was a long time coming, but we are delighted that Mayor deBlasio is sponsoring a bill that will be introduced into the City Council today, fulfilling an important campaign promise to put an end to the inhumane and unsafe horse-drawn carriages in New York City. Periodically, I would call the Mayor's office and ask what was going on with the promised bill. I suspect they got tired of hearing from me, but I never once sensed that the Mayor was giving up on his promise. They never wavered and were always resolute – just as the Mayor was when he was questioned about the pending ban in public. But after working on this issue solidly for nine years, I was feeling impatient and doubtful that it would ever happen so I was looking for a chink in their armor. It was not there and I am grateful. 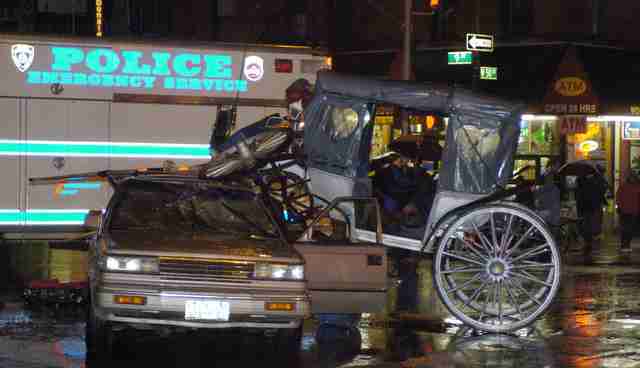 We are not ready to hang up the shingle for the Coalition to Ban Horse-Drawn Carriages. First, we have to pass the bill. When that happens, I hope to spend more time with Horses Without Carriages International, a global coalition I co-founded in 2008, helping other campaigns. But for now, this is a huge relief and the end of a very long first chapter. Now we are on to Chapter 2 - getting the bill passed and countering all the misinformation that has filled the media for the last year. The Coalition began this campaign in 2006 after the death of a young horse named Spotty. He was on the way back to the stable when he got spooked and bolted into traffic. Terrified, he ran into a station wagon, wrapping himself over the top. He was so badly injured, that he was euthanized on site. This horrific image of the carriage wrapped over the vehicle went viral. At that time, we were told by many political veterans that we'd never get a ban and should instead try for better conditions. But I knew from experience that "better conditions" do not happen when the carriage industry had such strong influence with past administrations. I was confident in my belief that if I were to spend an inordinate amount of time on an issue, it would be for a ban – not so-called improvements. We persevered and here we are nine years later. We have not seen the bill yet. But we were given the opportunity of an extensive briefing by the Mayor's office on Monday night. The bill wisely takes into consideration the disposition of horses and jobs for the drivers, offering them extensive custom designed job training or green cab medallions. Most people who lose their jobs do not get anything like this. The drivers' licenses will be sunsetted, expiring in 2016, not to be renewed. The primary issue that has always concerned us is what happens to the horses when they are no longer wanted in the industry. There currently is no protection and we want to make sure this requirement appears in the new proposed legislation. The carriage trade and some of the media have brainwashed many to believe that if there is a ban, the horses will go to slaughter. This was successfully countered in a Forbes piece in last October by Vickery Eckoff, which made reference to the Global Federation of Animal Sanctuaries that offered to manage the process of finding homes for the horses through their member sanctuaries. At that time, there was a waiting list of people and organizations who were interested. But the drivers would have to agree to this valuable resource since the horses are privately owned. Last year I released a study that showed that over the course of seven and a half years, beginning in 2005, at least 529 horses dropped off the Department of Health (DoH) rolls. 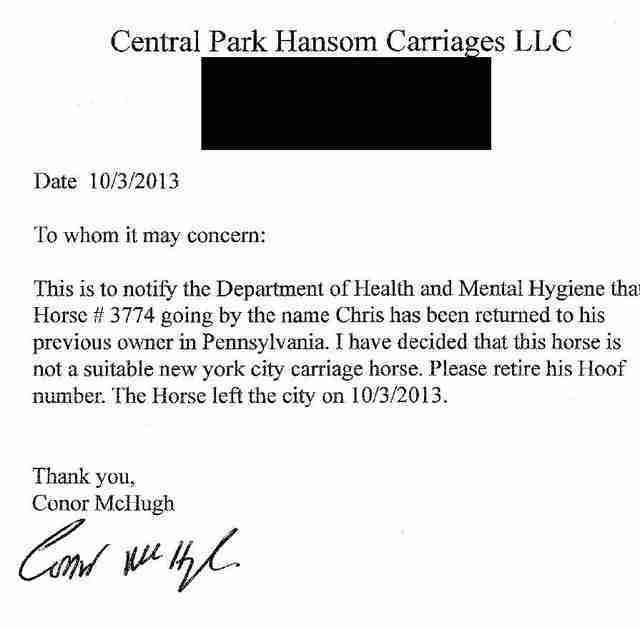 Between April of 2013 and September of 2014, my research from the DoH revealed that at least 59 horses fell off the rolls. The present law requires only that horses are disposed of "humanely" but provides no definition for what that means. Horses do not go directly to "slaughter." The route is more circuitous. 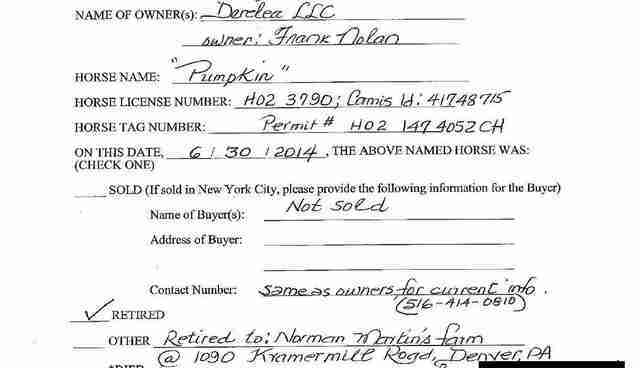 If a horse is sold outside New York City as most are, sales records are not required to be submitted to the DoH. We believe that many of the horses are laundered through Amish farmers who take them to kill auctions where they may be purchased by kill buyers who have contracts with Canadian slaughter houses. Drivers refuse to provide sales records saying this is none of our business. 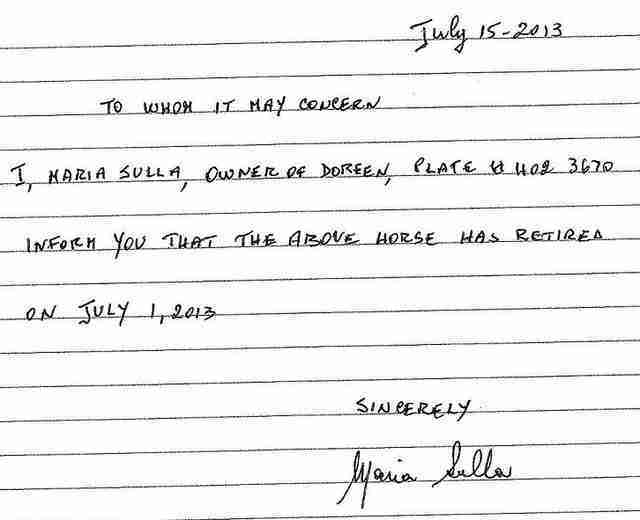 They need to show accountability for the horses who were used to make them a living. We feel confident this will be worked out and the horses will be saved. If the drivers truly care for their horses as they claim, they will cooperate and be grateful for any help in placing their horses. The spotlight will be on the drivers and if they attempt to get rid of a horse as they have done in the past, they will get bad publicity. Horses like Chris, pictured at the top, who was involved in an accident in midtown last September, is no longer in the system. His "release" document is below. Once a horse spooks, he or she is history. Doreen , a beautiful mare, was involved in an accident in Columbus Circle in the summer of 2012 that left her face bloody. She also is no longer. She "retired." Pumpkin spooked at the hack line this past June and ran wildly around the park before he was stopped. He, too, is no longer in NYC. The farmers have limited use for many horses. They would have to move the horse on, probably to auction. And what about all the others who did not get press and will not be remembered - who are also no longer in the industry? Some were here for more than eight or nine years, others fewer than three. They had names like Smokey, Bobby Jo, Alice, Phoenix. Dolly, Teddy, Ruby, to name a few. The list is too extensive to reprint here. They deserve some remembrance because the City of New York gave these poor souls no protection. I do wonder what happened to them. Please let's all work together to end this inhumane business. It's time that it is relegated to history and it is time for New York City to really move into the 21st century.